“Some of my ancestors had to live in the mountains,” I told Brandon as we drove along the open stretch of road through central Colorado. He gave me that look I get at least once a day that asks, what crazy ideas are getting into your head this time? When I moved to Colorado, a state I had never before visited, it always felt like home to me. Little did I know, a few weeks later I would be learning more about my heritage than I ever could have imagined. Earlier in 2015, I was putting on a pot of water to boil to make some pasta for dinner when I received a text from my mom. “Would you be interested in taking a trip to Croatia?” She explained how our Croatian cousin (who lives in the states) wanted to plan a trip for all of us to go stay out there. My response, without hesitation, “Is this for real? OF COURSE! 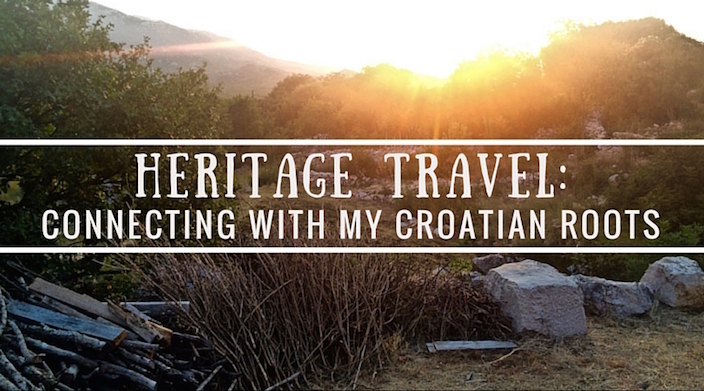 You don’t need to ask me twice!” When I’m asked if I want to travel anywhere the answer will always be yes, but since I have Croatian heritage this was even more exciting. As things tend to go with travel or other big commitments, our ‘plans’ started to fall through. I kept asking my mom when we were going to start figuring out where we were going, when, etc., but we weren’t getting any information. At this point, I was already set on going. “Why don’t we just plan it on our own?” I asked. And that’s exactly what we did. After months of planning and booking, we were finally ready to embark on the journey of a lifetime, and connect with our roots in a way we never dreamed would be possible. We were a group of 9 adults and 2 kids, not quite an easy feat in a small country during peak season, but we made it work and thankfully did not have any major travel mishaps. When our cousin who was supposed to plan the trip found out we were still going, she was surprised but also excited for us. 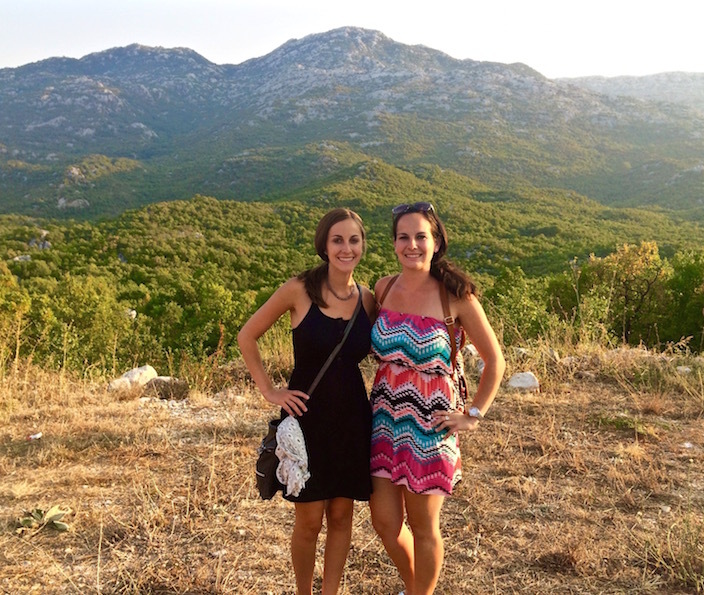 Her mother goes out to Croatia often and keeps in touch with the family out there, and she called to tell them “the cousins from America are coming.” Although they are technically on different sides of the family, they all know each other because they all live (or lived) in the same village. Heritage travel was about to become reality for me. 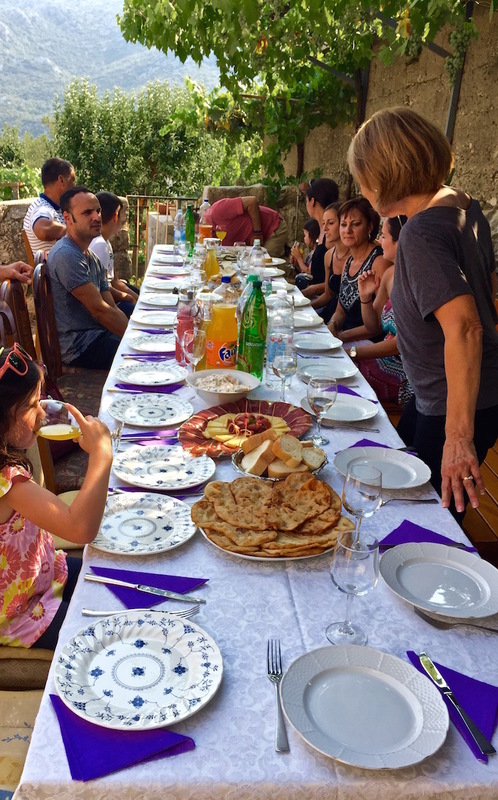 Soon enough, my aunt was able to connect with our cousin from Croatia via What’sApp, and we were all invited to their place for dinner and to meet the family during our trip. It was so exciting, although none of us had any idea what to expect. As we drove along, the road continued winding into the mountains. We finally arrived in the small village called Kotlenice. As we walked up to the house we were given the warmest welcome, like we were family that had known each other for years. 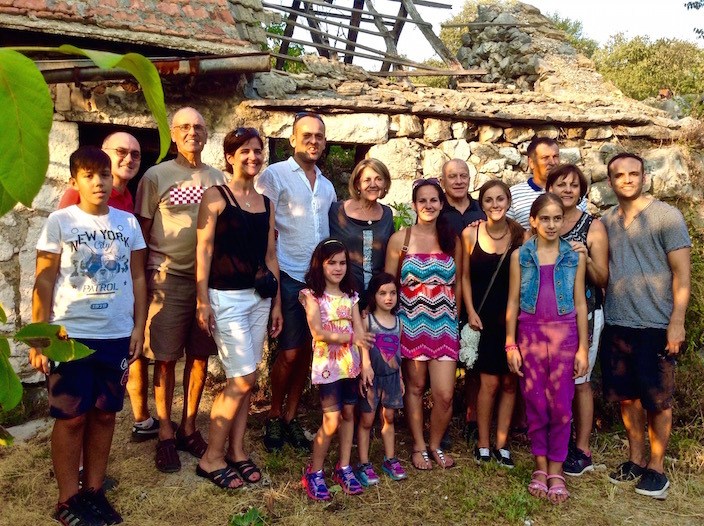 Within our group that was traveling together, we were already representing four generations, and we proceeded to meet even more generations for the very first time. 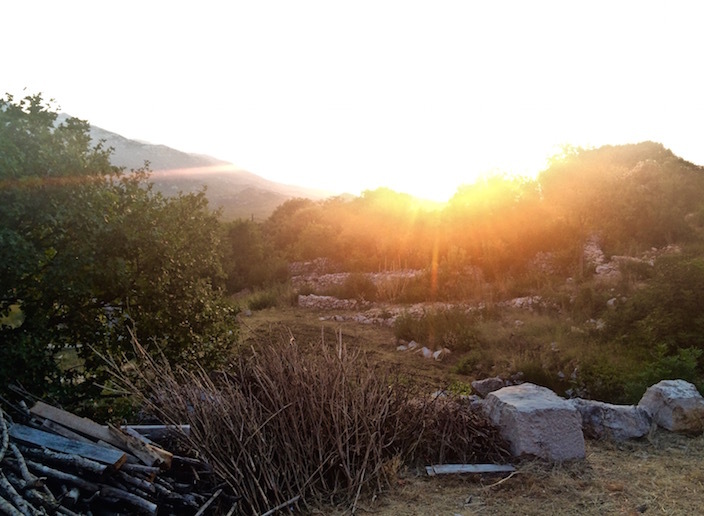 Next to the stone walls of the house, there was a long table set up with a beautiful backdrop of the mountains as the sun was just beginning to sink lower in the sky. We were shown around and then led back to the table to drink some homemade wine. 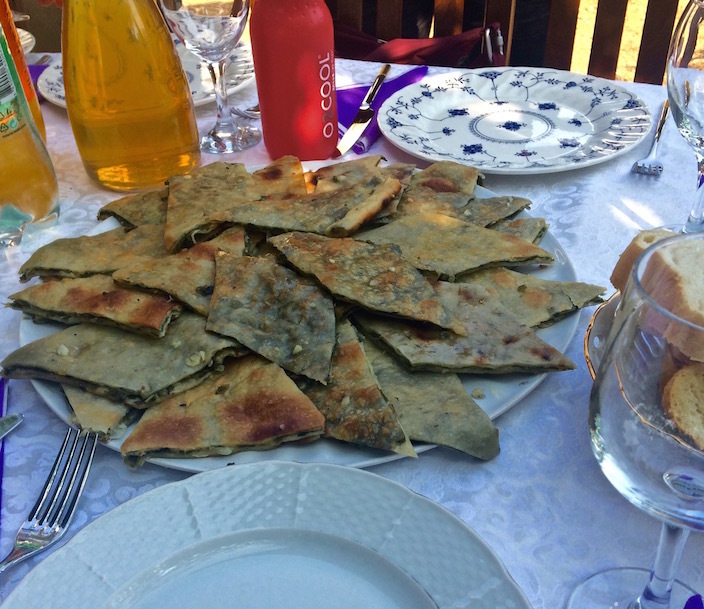 Shortly after, my mouth began watering as platters of soparnik (what we call spinach pie back home), pršut and cheese, bread, and more were placed down on the table. Okay, you need to control yourself, I kept thinking. You know there is so much food and if you don’t slow down you’ll never save room to finish it all, I thought as I took my third slice of soparnik. Everything was so delicious and we soon learned that we hadn’t even seen the main course yet. 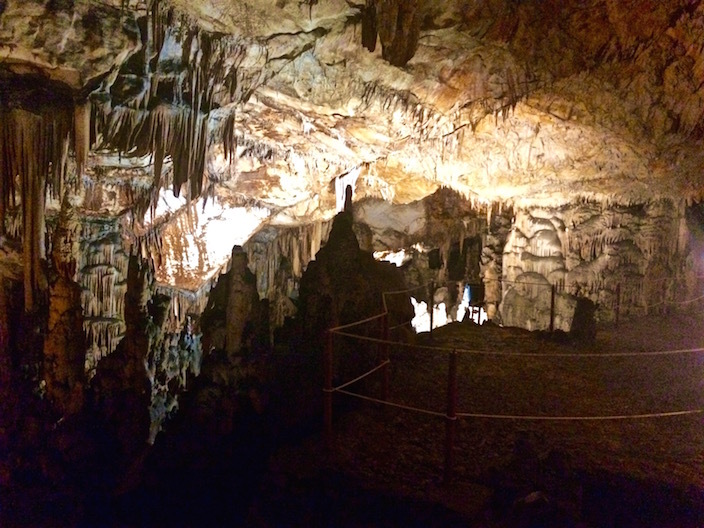 Thankfully, we had a small break in between as we were taken to visit the caves, which are a “protected geomorphologic natural monument” called Špilja Vranjača. 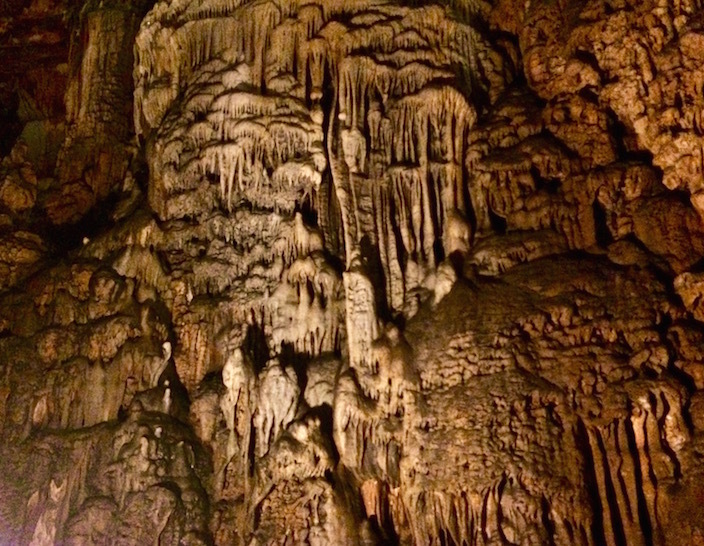 To put it in simple terms, it’s a really cool underground cave located at the foothills of the Mosor Mountains that is unlike anything you’ve ever seen before. The cave is split up into two parts. The first entrance leads to one part that the locals have known about for ages. 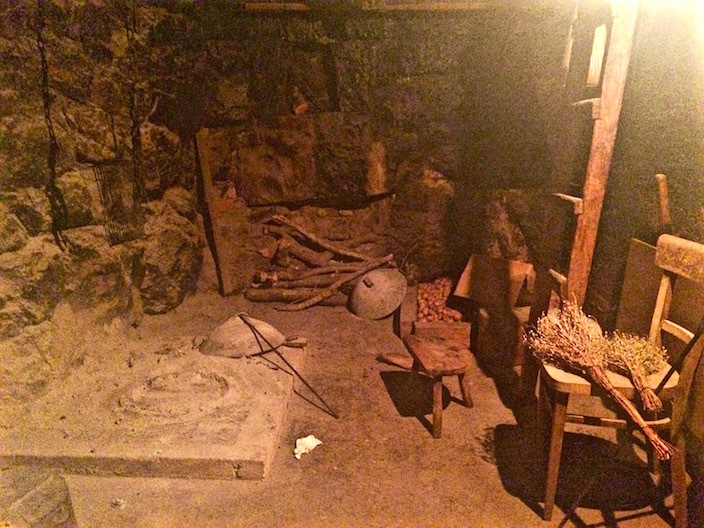 The other was discovered in 1903 by Stipe Punda, who owned the land where the cave is located, when he found a small passageway leading into the second tavern where the temperature is always at 15⁰C (59⁰F). 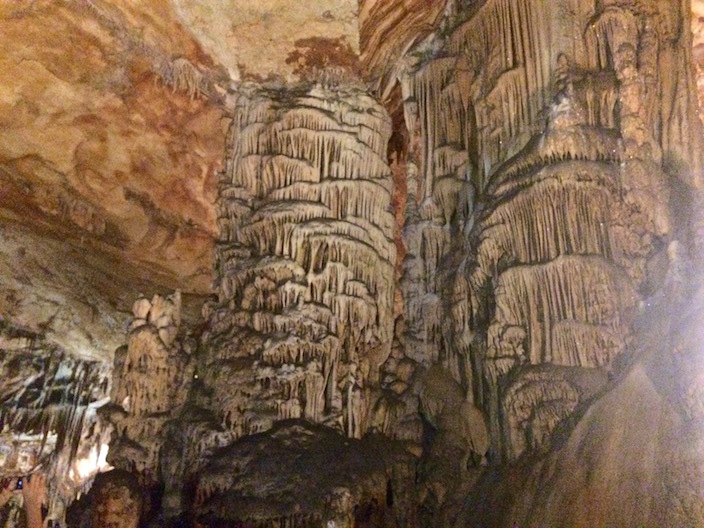 In 1929, the cave was officially opened to the public after putting lots of work into making it suitable for visitors, like adding stairs, pathways, lights, and handrails within the cave. 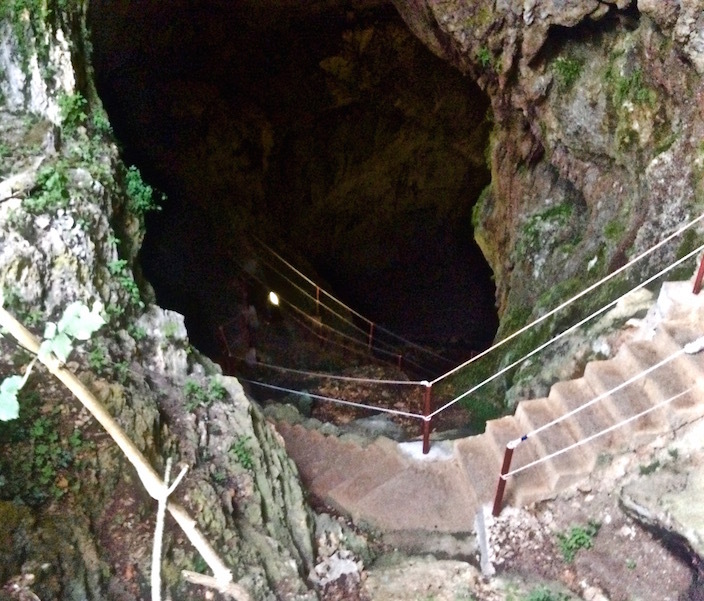 As we descended down the stairs into the depths of the cave and the daylight grew farther away, the air began to feel cool and damp against my skin. Our guide was Marko Punda, the grandson of Stipe, who is now the current landowner. While showing us around the caves, he told us about how his family found the caves and helped make them into the tourist attraction that they are today. 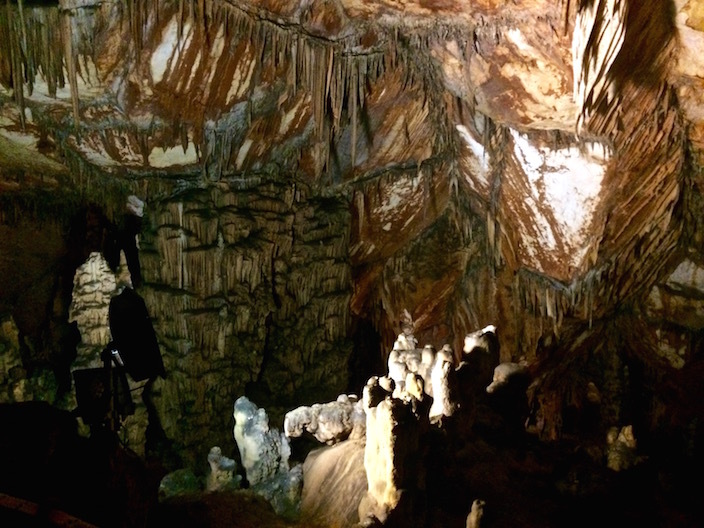 The incredible formations inside the cave date all the way back to 7000-8000 B.C., and they immediately put me in awe as no one would ever know what was underneath the ground by just looking at the land from above. Upon returning to the house, the main course was just about finished, and we got ready to enjoy a hearty meal with family and friends. 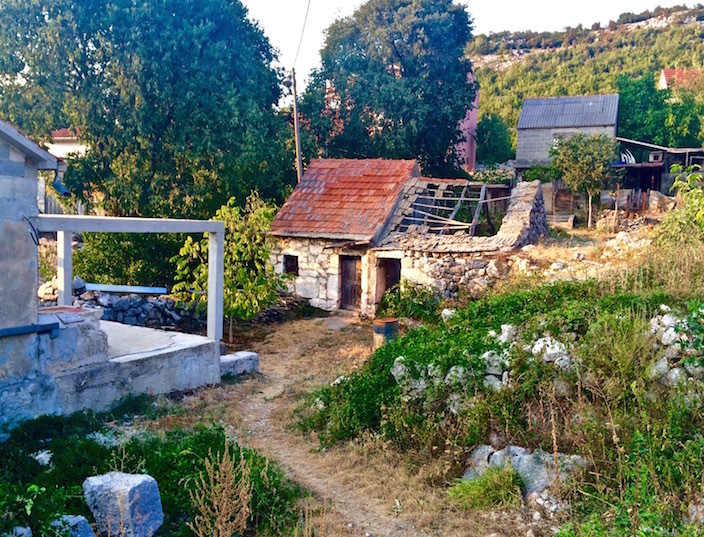 As is typical in the Croatian countryside, dinner was made in the wood-burning outdoor oven. Among the food we ate was home cooked peka with potatoes, tomato and cucumber salad, and more bread of course. Despite already being full after a delicious dinner, I still indulged in the fruit and variety of cakes that were brought out for dessert. We talked as we ate long into the night, catching up on a lifetime of stories and memories of generations of family, some that we had never spoken to and some we never even knew existed. By far, one of the most special parts of the day was a stop we made on the way back from the caves. We got to see the homes where my great grandmother and great grandfather used to live. I truly never imagined I would ever have this opportunity. It was amazing to see the way they lived. 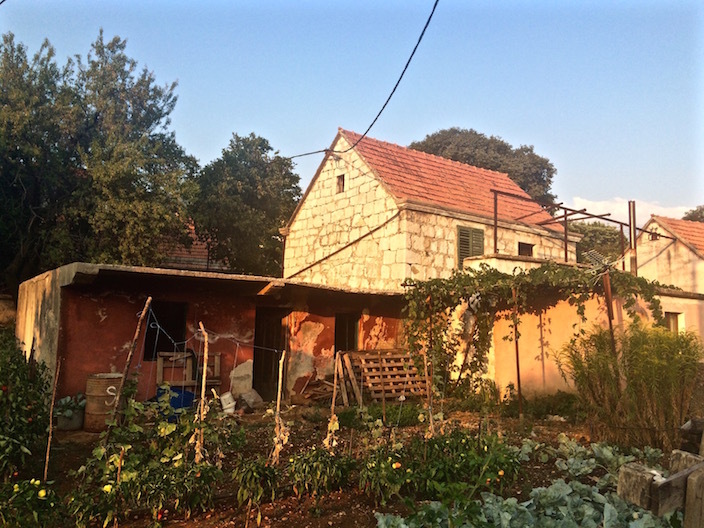 The house in the first photo below was where my great grandmother grew up. The right part of the house that is destroyed was where another family lived. She grew up with her parents, 3 other sisters, and 1 brother just on that left side of the house! That is 7 people living in one tiny room. Travel can be funny like that. Sometimes opportunities present themselves that you never dreamed were even a possibility. I don’t know if I’ll ever have the chance to return, or if they will ever visit the states, but I do know that I will always remember their hospitality and this experience is one that I will treasure forever. As I turned around, I saw the sun just beginning to graze the horizon among the same mountains my great grandparents used to see every day. Now I know that having a connection to the mountains is more than just a feeling. 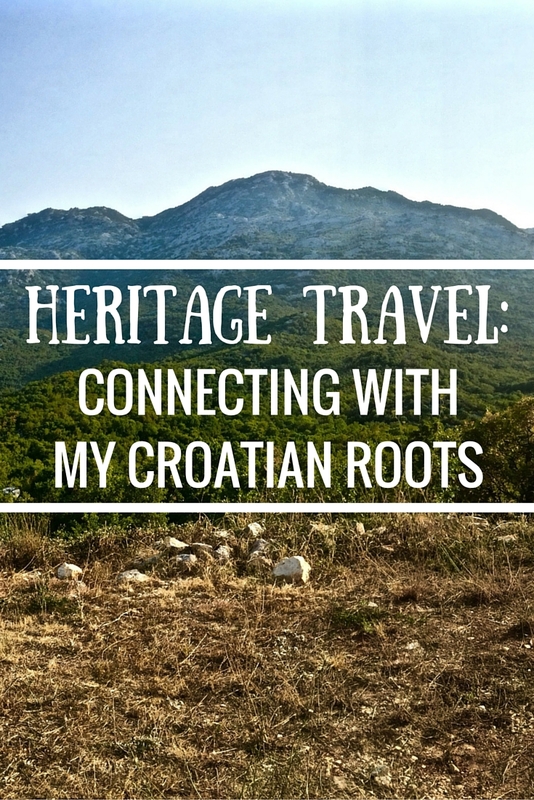 Have you ever gone back to your roots and explored your heritage? Tell me about it in the comments below! If not, maybe now is the time to start! Awesome story. I started doing some genealogy a few years ago and connected with my dad’s side of the family in Missouri that I had never known. I hadn’t even seen my dad since I was in high school. I had heard a few family names (brothers, sister, ect, but that was it. In my research I found out my dad had died in 2000 and one of my uncles had been trying to find us off and on since then. My husband and I took a trip to MO later that year and got to meet about 20-30 family members on that side. It was one of greatest and weirdest experiences. We still keep in touch and have been out there several times since. So glad I found them. Hope you get to see that side of your family again someday. Thanks for sharing. That’s awesome that you all found each other Samantha! It is such an incredible experience to meet relatives so many years later. Thanks for sharing your story! It was amazing to see both the differences and similarities in the culture!